An Australian survey calls the honesty of the average Aussie into question, indicating most tell three lies per day. The survey of Australian adults by 20th Century Fox Home Entertainment found those polled admitted they lied most often to romantic partners, followed by friends and coworkers, the Melbourne Herald-Sun reported Monday. The pollsters said the most common lies had to do with the whereabouts of the speaker and whether household chores were completed. The entertainment company said nearly all male respondents admitted exaggerating the number of sexual partners they've had in their lives. A Fox spokesman said two-thirds of respondents didn't think of themselves as very good liars but would "try to lie if it helped to make their lives a bit easier." Details of the survey method were not reported. An elderly New Mexico woman whose toes were probably eaten by rats while she slept has died of complications from pneumonia, family members said. Maria Najera, 85, had been hospitalized since Dec. 20 when it was discovered that something in her trailer home had chewed off all her toes, KTSM in El Paso, Texas, reported Tuesday. Najera's daughter-in-law said the woman was unable to feel her extremities because of complications from diabetes. A Welsh man who went into cardiac arrest while napping in a chair was shocked back to consciousness with a defibrillator eight times, paramedics said. Paramedics said they were called to the home of Ray Lecomber in Kilgetty when his wife, Brenda, noticed him snoring oddly and was unable to wake him, Wales Online reported Tuesday. The paramedics said Lecomber went into cardiac arrest and they resuscitated him with defibrillator pads. "On the way to Withybush Hospital he stopped talking and his breathing decreased," paramedic Nick Tebbutt said. "Again we shocked him and he came to, carrying on the conversation where he'd left it as if nothing had happened." "This happened four more times before we got him to hospital," he said. "The next day we learned he had arrested two more times. We really did fear the worst for him." Lecomber said he is being checked out by doctors at Morriston Hospital's specialist cardiac unit. The suit late rock 'n' roll star John Lennon donned for the Beatles' iconic "Abbey Road" album cover sold for $46,000 at auction, Britain's Daily Mail said. The white ensemble, made in Paris in 1969 by designer Ted Lapidus, was sold at the Braswell Galleries' annual New Year's Day Auction in Connecticut Saturday. An online bidder who wished to remain anonymous purchased the suit, which had been expected to sell for more than $116,000 when it hit the block, the Mail said Monday. "The 'Abbey Road' image is one of the most unforgettable album covers of all time and the famous shot for the final Beatles album took on a life of its own," the Galleries' Web site said. "The suit figured prominently, suggesting the cover shot was symbolic of Paul (McCartney's satirical) funeral procession with John dressed in white represented the clergy. Conspiracies aside, it would be difficult to overestimate the impact Ian McMullen's famed shot of the four musicians crossing the zebra cross walk has had on countless Beatles fans. Forty years after first being published, the familiar image is so indelibly imprinted on the public imagination it serves as the catalyst for thousands of multi-generational Beatles fans to make the pilgrimage to the famed spot and pay homage." 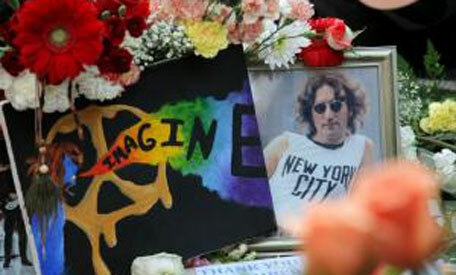 Last month, Lennon's family and admirers marked the 30th anniversary of his slaying in New York. The peace activist and musician was 40 when he was shot down outside his Manhattan apartment building by a deranged fan who remains in prison.